The Dalbello Gaia 4.0 is a terrific ski boot for growing little girls. 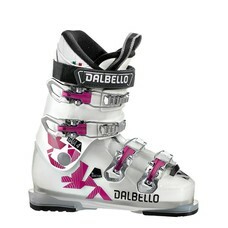 The Traditional Four Buckle Overlap Design helps get little skiers prepare for the style and fit of an adult boot. The Flex of the Gaia 4.0 has been indexed for shorter and lighter weight skier to be able to bend the boot to have total control over her skis and learn proper positioning with her knees over her toes. A Velcro Strap adds a little extra stiffness and rebound just in case your little lady likes cranking up the speed to catch up to mom.